Whether you are young or old, Halloween is a fun holiday. However, if trick-or-treating just isn’t your thing, you can still indulge in festive holiday candy. Shake up a few spooky candy-themed Halloween cocktails and enjoy an adult-friendly Halloween! Combine rum with vodka, blue curacao, lemon juice and lime juice in a cocktail shaker with ice. 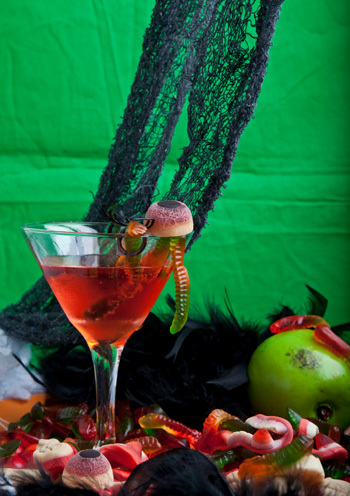 Shake well, strain into a martini glass and float gummy worms in the glass. Combine vodka, Kahlua and orange juice in a cocktail shaker with ice. Shake well and strain into a martini glass. Garnish with a few Tootsie Rolls. Dip the rim of a rocks glass into chocolate syrup then dip into crushed peanuts. Combine hazelnut liqueur, chocolate liqueur, milk and ice in a shaker. Shake well and strain into a prepared glass. Garnish with a mini peanut butter cup. Planning a costume party this Halloween for grownups? Van Gogh Vodka has some ideas for vodka cocktails, shots and martinis that are sure to be great treats for adult guests.